This year we have chartered one yacht - OTTER - from Pembrokeshire Cruising based in Neyland on Milford Haven, Pembroke, giving us a range of weather dependant passage options. These include sailing the southern Irish coast or another attempt to visit the Isles of Scilly or the Bristol Channel and Pembrokeshire coast. So expect some night hours en passage with the possibility of experiencing helming with stars to steer by, and the Milky Way showing her beauty. Being May we should have some marvellous sightings of wildlife such as puffins, dolphins, porpoises and more. Costs for this charter will be £310 per berth to include an outboard for the dinghy. Costs based on 5 members per yacht. This Sailex is now FULLY BOOKED. Members wishing to join this event in 2019 can apply for a standby place and will be contacted should a place become available. A beautiful high quality yacht with remarkable sailing performance. 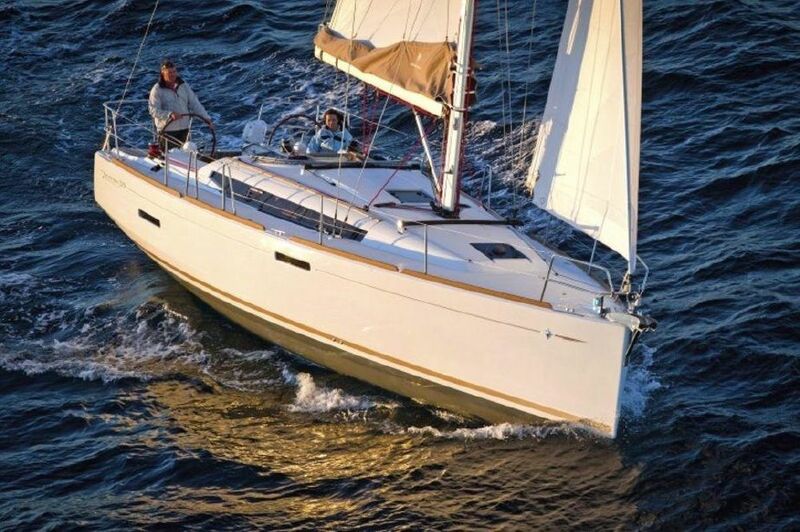 The Beneteau Oceanis 45 is perfect for those who like a touch of luxury when sailing as a family or a group of friends. 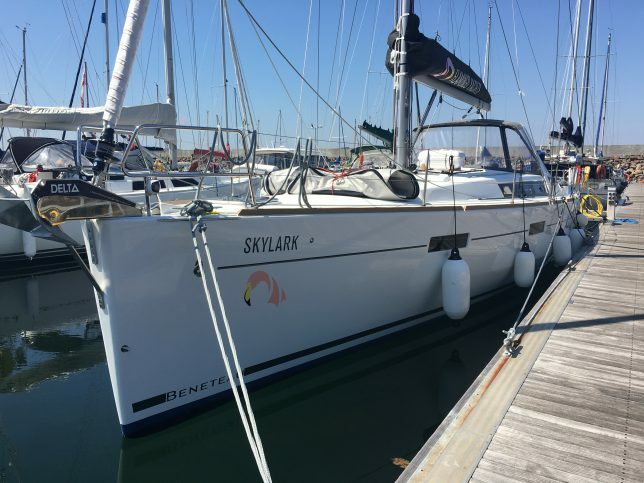 New to the fleet for 2019, Flamingo, our Oceanis 45 is coming to us straight out of the wrapper from Beneteau as a sister ship to Skylark. We hope you will be as excited about her as we are. Yacht shown not the new Flamingo. The Beneteau Oceanis 45’s we have chartered - Flamingo and Skylark - are described as 10 berth yachts with 4 double cabins and a double berth in the saloon. Berth costs are based on 6 people and may be reduced should we take one couple on each yacht. As such please budget for a maximum cost of £570 per berth. The yachts are complete with a dinghy and outboard. Details of the sailing plan will be discussed at the sailex meeting but with long days on the west coast at this time of year options include the more sheltered waters of the Firth of Clyde or further afield to explore the Isle of Islay. I believe there is a distillery or three on the island! LATEST. Bookings for this sailex have been quick off the mark and it looks now like both yachts will be fully booked very shortly. The booking link remains open but the latest position regarding availability can be obtained by calling John Bryant. We have just two berths available to book at the present time. The Cornish Sailex will set out from Plymouth Hoe. From here places such as Dartmouth, Salcombe and Brixham are to the East, and Fowey, Falmouth, Helford and Newlyn to the West to name just a few of the places we might visit. The coast itself is pitted with interesting nooks and crannies for stop overs. Add to this such famous lighthouses as Eddystone, Wolf Rock and Longships and we should have fun sailing this coastline. We have chartered a Delphia 40 and a Hanse 385 for this event. Costs for this charter have been calculated to include the following extras - an outboard for the dinghy, and gas for the yacht, will be £345 per berth based on 5 members per yacht. Parking is available at the marina. This Sailex is now FULLY BOOKED. Members wishing to join this event in 2019 can apply for a standby place and will be contacted should a place become available. Our traditional End of Season event (for UK waters) will follow recent practice and comprise a long weekend with various navigation and sailing challenges organised by the Lead Slipper - Dave Bond. We plan this event to start and finish at Port Hamble. This year the challenge could even include a round the island sail. It has been agreed that crew may overnight on the yachts at Hamble marina on Thursday 3rd October to permit an early start on Friday 4th with the sailex ending on Sunday 6th October at 17:00 hours..
Two Oceanis 37’s have been chartered and a third is an option should we receive the same level of interest that we had in 2018 Costs for this sailex will be £195 per berth. We currently have eight berths available. Yes, the EOS will not be the actual “end” of our 2019 sailing season as we have returned to having one very warm sailex to close the year and set us up well for the colder months at home. The weather in the Canary Islands and Lanzarote is very pleasant throughout the year. In the colder months in Europe, minimum values in Lanzarote are around 15 degrees C and a maximum of 25 degrees C. The wind in Lanzarote is intense throughout the year and the trade winds blowing from the Atlantic make this a paradise for sailors. We have chartered two Bavaria 46 cruisers both 2014 yachts from the premier charter company in Lanzarote berthed at Arricefe Marina. The yachts are Carlotta and Django, both 4 cabins with a double in the saloon. Flights from East Midlands are available with Jet2.com from the East MIdlands for less than £270 with seat allocation, bags and on-board meals. Timing for these Saturday flights are good for joining the sailex and for returning home after the event. Some members may be tempted to stay a second week on the island to make a longer break. Details of a proposed sailing plan are currently being worked on and I hope to add some more detail to this page when available. This event is now fully booked. Thank you all for your support. One Beneteau Oceanis 37 and one +Dufour 430 GI have been chartered for the Easter Sailex. The Sailex will commence formally on Thursday 18th April however we have arranged for the crews to overnight on board on the evening on Wednesday 17th April to allow for an early handover and departure on the following morning. Plans for this event are at an early stage and will be updated by Dave Bond in good time although the options include south coast to Weymouth or possibly a visit to Alderney - in all cases the forecast will have the last word. We have now closed booking for this event. Costs for this event have been based on 5 members on the Oceanis 37 and 7 members on the Dufour 430 and are £310 per berth. It has been agreed that crew may overnight on the yachts at Hamble marina on Thursday 11th October to permit an early start on the Friday. We are currently sold out on all three yachts chartered, but have skippers and the opportunity to charter a fourth yacht should there be sufficient demand. We will commit to a fourth yacht with a further five bookings from members / friends. Any bookings made after 2nd August will be on the basis of a reservation pending the total new bookings being five. Berthing will be arranged by the Lead Skipper in accordance with TOG rules, and take into account any preference expressed by the member. Member (not currently booked on to this event) wishing to join the 2018 End of Season Sailex are encouraged to make an early booking such that we can secure a matching yacht. We have chartered two Oceanis 38's from Fairview Sailing and will seek to add a further yacht should there be sufficient demand. Plans are at an early stage but don't let that deter you, sign up and chip in with your ideas for this event. The aim of this trip will be to cross the Channel from Port Hamble to France or the Channel Islands and explore the area before returning to the Solent. Possible islands to visit include - Alderney, Guernsey, Sark, Jersey and Herm. This expedition will give those aspiring to RYA Yachtmaster Practical Courses the possibility of qualifying passages.With strong tides, challenging navigation and exciting sailing, a trip to these beautiful islands is one not to be missed! Areas like the “Alderney Race” and “The Swinge” offer opportunities for some of the fastest SOG you will experience on a Yacht. The Lead Skipper will be Andy McWilliam and costs for this Sailex will be £400 per berth based on a crew of 5 for each yacht. As of January 2018 this event is fully booked. The plan is to explore the Outer Hebrides visiting destinations such as Isles of Bara, Mingulay, with time to explore the Isles of St Kilda - weather permitting. We have reserved one Jeanneau Sun Odyssey 43 - Eloise, see above, with six/seven berths. Going in May should give good opportunities to see a wide range of wild life both at sea and on land. This Sailex has been arranged following the very successful "Best of the North" Sailex arranged in 2017 - see TOGline for reports of that event and the News blog on this web site. We originally committed to charter two similar yachts due to there being limited availability and members were encouraged to make their 2018 plans soon and commit to joining this two week sailex. Demand has been such that we have now released one of the yachts and have six confirmed berths for the Yacht on charter. There is potentially space to add one more member on this trip (male or female), please discuss with Alan Mortimore should you have an interest. It will now be a Saturday start and finish event. This Sailex will include some long passages and potentially lumpy seas. As of December 6th members interested in taking a place on this event are advised to add their name to the standby list AND speak to Alan Mortimore regarding availability. The lead skipper will be Alan Mortimore. The total cost of this Sailex will be £880 per berth for the two week charter (6 on board), or £760 per berth (7 on board), this includes the cost of an outboard for the dinghy. MAJ17 The Spanish Jaunt - Lead Skippers Dave Bond and Paul Burghart SAILEX NOW FULL on the yachts chartered. Please continue to make your bookings while our skippers seed to add further capacity. After a couple of very successful years in Croatia, this years “Warm Weather Trip” will be a Spanish Affair. Many of us have been around the Island (of Wight!) but the aim of this trip is to circumnavigate the Beautiful Spanish Island of Majorca. The Boats will be from Palma Marina, which is next to the airport, so transfer times will be just a few minutes! We have now committed to charter a couple of 2016 Beneteau Oceanis 41.1’s (a bit like the one shown below) and one new 2017 Hanse 415. Booking for this sailex has been brisk and we now have a full complement for the three yachts chartered. We will open the standby booking page for any member wishing to add their name to the list. There is no commitment but TOG will make contact with members on this list first should a booked member have to withdraw at some future date. Boats in Majorca do tend to book up rather quickly so members are urged to make their bookings asap to enable us to reserve the boats and also to avoid disappointment. Likely cost for the boats will be £650 per person assuming 5 crew per boat, this price includes outboards, towels and linen and boat cleaning upon departure. Flights will be booked separately and at the moment seem to be £240-260 return. Select the link to the 2017 booking form and then choose the “Spanish Jaunt” trip and enter your details. SCO17 Scotland - The Best of the North. Lead Skipper Alan Mortimore. We have reserved 2 yachts and demand has been above expectations for a two week sailex. We are now almost fully booked with just one berth available. Please use the on-line booking link at the top of the Sailing Programme page on the TOG web site to book the final place. Once all places are booked we will open a waiting list for anyone interested is taking a place should circumstances dictate that a member has to withdraw. For the first time we have arranged a new format for the End of Season Sailex. It will be shorter - just a long weekend (Friday 7th, Saturday 8th and Sunday 9th) and will be promoted as the "Bring a Friend" Sailex. Members will be given the option to travel down to the Solent and board the yacht on the afternoon / evening of Thursday 6th October and overnight on board to make an early start on Friday 7th. This will allow three full days sailing. Members have expressed a wish to have a shorter event so that you can encourage your non sailing friends to give it a try on a modern yacht in the sheltered waters of the Solent. Booking has now started and Beneteau Oceanis 37 yachts have been chartered for the event with 5 on board each yacht. Cost of this event is £195 to TOG members. Support has been excellent this year and we are now fully booked. Please make contact should you wish to put your name on the waiting list for a late place should a member have to withdraw. A 10 day sail from Largs, North Ayrshire, Scotland, to circumnavigate the Isle Of Man with view to taking time to visit Peel, Port St Mary, Castletown and Douglas. Returning to the Clyde via Strangford or Bangor in Northern Ireland. This extended 10 day sailex will involve several long passages and a possible night sailing and thus will be attractive for those wishing to add this experience to their log. Following a successful charter to the Windward Islands this January - see reports in TOGLINE (Winter Newsletter), we are pleased to offer a Sailex to the Leeward Islands in January 2016. We have a reservation for two 4 cabin, 3 or 4 head yachts, planning 7 members per yacht. These are both 2013, one an Oceanis 484 and the other an Oceanis 485. 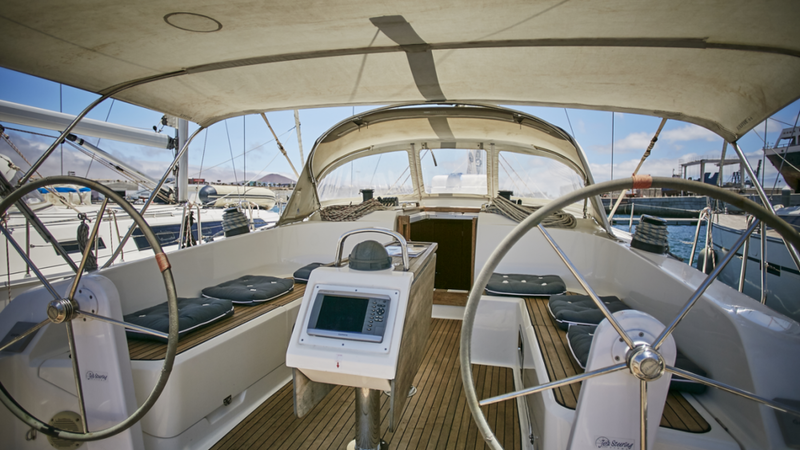 Yachts are complete with dinghy, outboard, bed linens and towels, fridge, freezer, and 6Kw Aux power.